In Europe, Pygeum Bark is the drug of choice for doctors who wish to help men with prostate disorders. 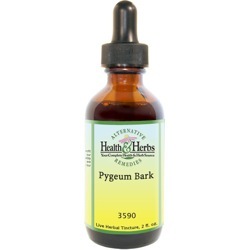 Pygeum bark is derived from an African evergreen and is used widely throughout Europe to treat male baldness. You can apply the tincture directly to the scalp as they are somewhat mild and will not harm the skin. Historically, the powdered bark has been used as an herbal remedy for relief of bladder and urinary disorders. Certain studies show that it also has effects on fever, sexual performance, malaria, and psychosis. Pygeum has three categories of active constituents. The phytosterols have anti-inflammatory effects on the body. The pentacyclic terpenes are believed to be effective for edema and as a decongestant. The last group, the ferulic esters, reduce levels of hormone prolactin and block cholesterol in the prostate gland. The plant contains phytosterols which have an anti-inflammatory property that has been found to work by inhibiting the production of pro-inflammatory prostaglandins in the prostate. It is also thought to increase urinary function, which often becomes limited due to enlarged prostate conditions, or BPH. This action can be especially helpful if there is frequent nighttime urination. Traditionally, this tree's bark was made into an extract and used to treat genitourinary problems. As a diuretic, its properties help to increase the volume and flow of urine. This plant extract may be useful for flushing and dissolving uric acid sediment. This action may help to rid the body of uric acid that causes arthritic calcification and gout. Some of the less researched traditional uses of Pygeum Bark tincture has been for kidney disease, malaria, partial bladder outlet obstruction, or BOO, and other bladder disorders, sexual performance, urinary tract infections, inflammation, and psychosis. Pygeum Bark has shown to inhibit the enzyme 5-alpha-reductase, which reduces DHT, and is used widely throughout Europe to treat male pattern baldness. You can apply the tincture directly to the scalp, which will not only help to prevent dandruff, they will also help to keep the hair clean and prevent scalp irritation and stimulate healthy hair growth. Clinical studies also suggest that your diet plays a significant role in hair loss. So, consuming a lot of junk food and not getting the proper vitamins and minerals in your food, may leave the hair dry and brittle, which can stunt the growth of your hair or lead to hair thinning. Ingredients: Pygeum Bark, Structured Water, and 20% Alcohol. Non-Alcohol: Pygeum Bark, Structured Water, Vegetable Glycerin. Contraindications: There have been some reports of nausea, dizziness, stomach upset, visual disturbances, diarrhea and constipation with the first use of Pygeum Bark. Pregnant women should not take Pygeum due to the lack of scientific evidence about its safety for developing fetuses. Pygeum bark supplements should not be used for children. It may cause an increase in the benefits to the prostate from prescription drugs or other herbal supplements used for reducing swelling of the prostate. For this reason, care should be taken when adding this herb to any regimen. Keep in mind that it is important to keep taking any prostate medications your doctor has prescribed. There are no known drug or nutrient interactions associated with Pygeum bark at the time of this writing. From Dionysios Skaliotis, Lic.Ac., of New Bedford, Massachusetts on 12/10/2016 .